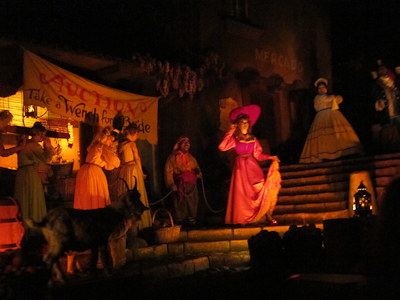 Yo ho, yo ho, it’s time to ride a classic! 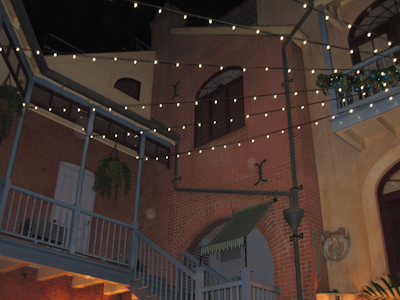 Over in New Orleans Square, get ready to enter the Bayou and see a lively band of pirates! Except for the dead pirates, who are not lively but who you will also see. 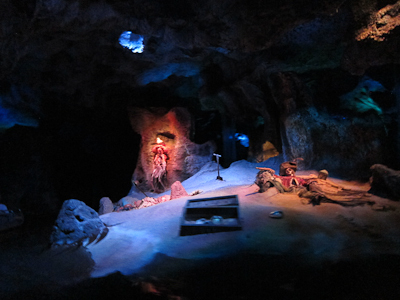 Pirates was the last ride that Walt helped design, and it opened shortly after his death in 1967. I mean the ride opened in 1967. Walt actually died in 1966. Just to clarify for the purists in the crowd. You enter the queue under a bridge. 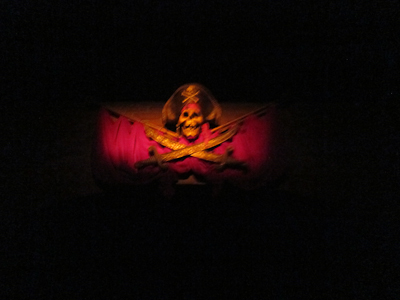 Here there be pirates! Arrrrr!!! 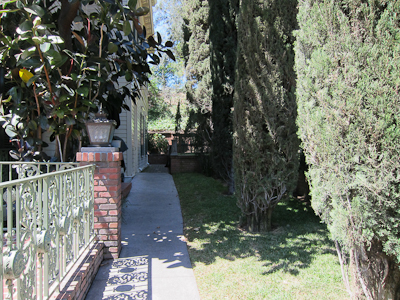 When it’s crowded, both sides are open. I personally think the right-hand side is shorter, although I have no substantial evidence to back that up. 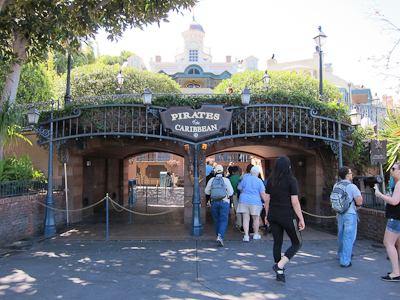 Pirates is housed in a lovely antebellum manor that I didn’t take pictures of on this particular visit because it was under construction, so I’ll post those later. Not crowded. It was a good day. 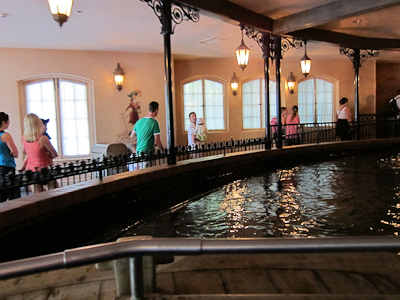 And the Pirates queue has another one of my favorite things–in line drinking fountains! 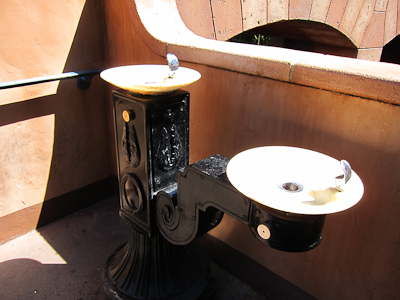 I think my attraction to water fountains came from when I worked at a summer camp way up high in the mountains where you could get dehydrated in like 3 seconds, and we always told the kids to stop and take 2 drinks from the water fountain whenever we passed one. I no longer am in this habit (can you imagine how long it would take to get through an airport???) 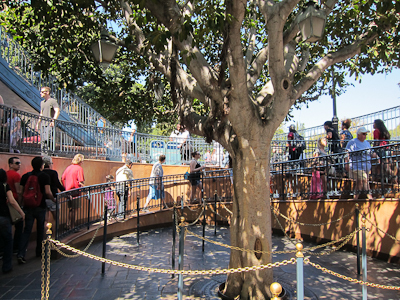 but I do feel compelled to do it at Disneyland. Go figure. 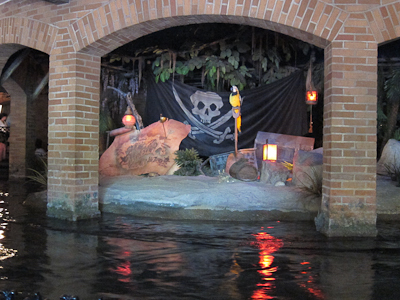 When you enter the building, you see an appealing little island with an opinionated bird, the Jolly Roger, and a map. 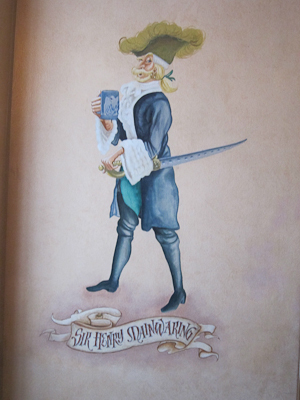 Decorating the walls are portraits of various pirates and lords. 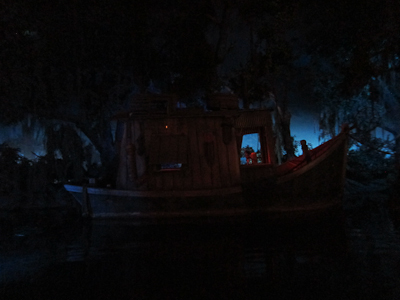 You board your boat and are strongly admonished to not take flash pictures. 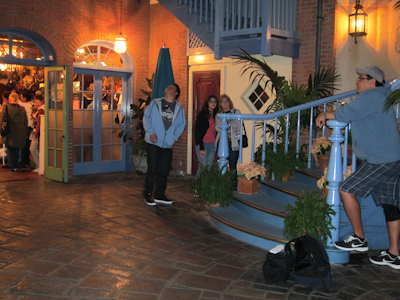 And really people, when they say “no flash photography,” please don’t use your flash! It drives me bonkers! And ruins the effect for everyone else! Also, since I wasn’t using my flash, the picture quality in this post from here on out is going to get sketchy. But such is the price you pay for not using your flash. Don’t worry about crappy pictures–live in the moment! 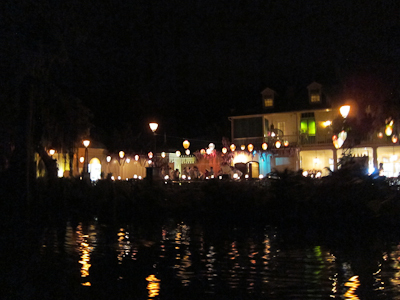 First you gently glide through a bayou with the Blue Bayou restaurant on your right-hand side. 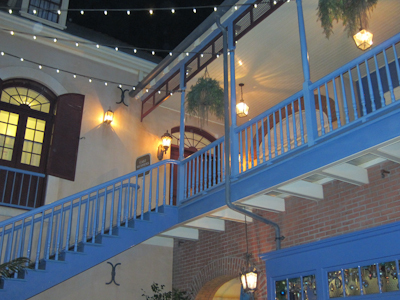 The Blue Bayou is a very cool place to eat, especially if you request a waterside table. You may have to wait for it, but it’s really charming. Now I’m sure you’ve noticed that this is all quite dark. That’s because it’s simulated nighttime. Well, here’s where Shelby goes all dorky on you and admits something embarrassing–for years I thought this was just open to the night sky. In my defense, for many years growing up, my family only went to Disneyland at night, when my dad’s company sponsored a corporate night. 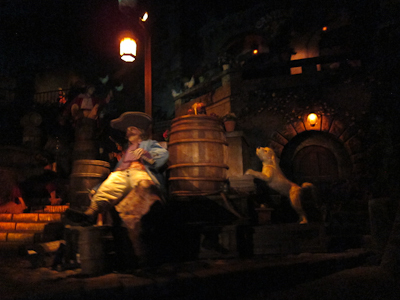 Pirates was one of the rides we always made sure to go on. I figured out it was inside NOT because I rode it during the daytime, but because I rode it in the rain. Specifically, it was POURING, and we got on the ride and I thought “Oh, it stopped raining!” and then when it was over I looked outside and it was still pouring and then (and only then) did it occur to me to look up and see that I was still inside the building. Dead men tell no tales. Women too. And then there’s a drop. It’s not a big drop, but it’s a surprising drop if you don’t know it’s coming. 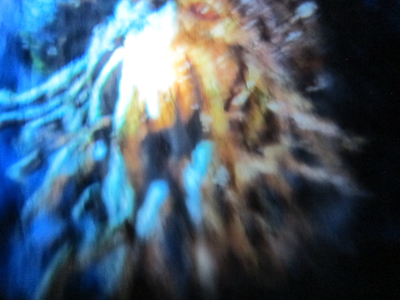 Also you can get a little splashed on landing so cover your camera lens and glasses. Also there’s another drop. 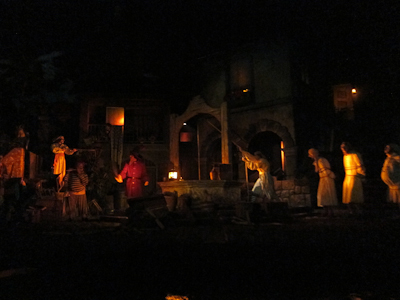 This one comes as quite the surprise to people who are used to the Disney World version of Pirates, which only has one. So consider yourself warned. 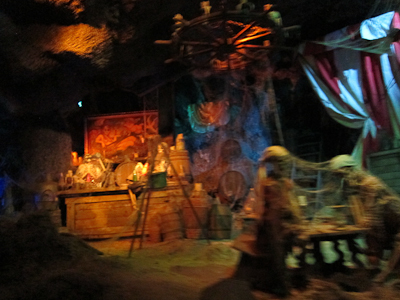 First you enter the scenes with the dead pirates, like these guys who didn’t make it very far off the beach. 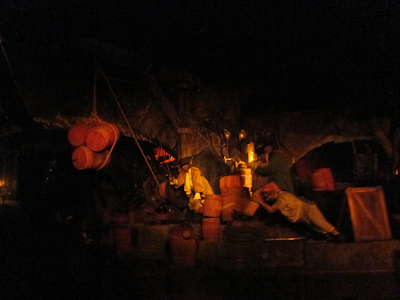 You move along through scenes of pirate recreation, except they’re dead pirates and dead men tell no tales. 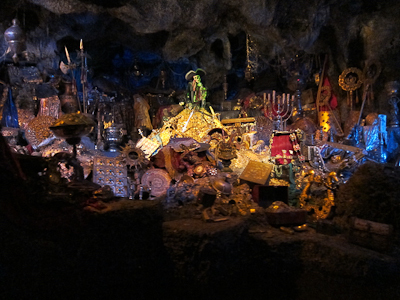 There’s the pirate treasure, but what good is it if you’re dead? 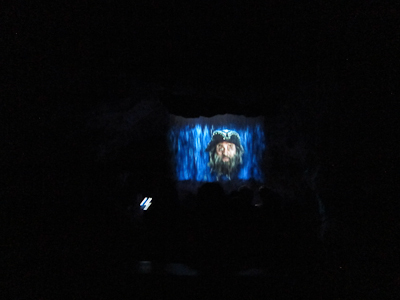 Both Davy Jones and Blackbeard are like “Dude, there’s a pirate’s curse, but go for it if you want to” and of course you want to because you’re on a boat and what else are you going to do? So you get thrust into the middle of a battle between a pirate ship and a fortress. 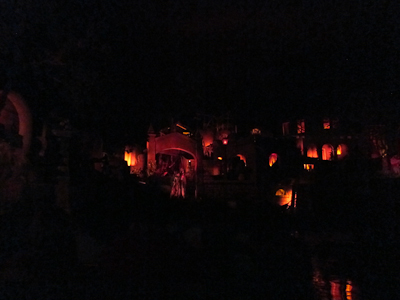 At this point they’re playing the theme from the first Pirates movie, which is totally awesome because it’s a great song. Up to that point you’ve been yo-ho-ing. Captain Jack Sparrow is hiding around here. Can you spot him? Oh! 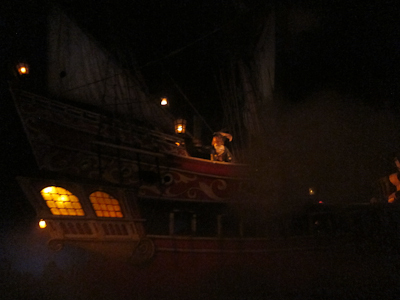 I think I see Captain Jack! You go past a couple more slovenly drunks before you realize that the town is on fire. And despite the danger, the pirates are still shooting at each other. And just before you leave the building (much like Elvis), it appears that Captain Jack Sparrow has indeed found the pirate treasure himself! 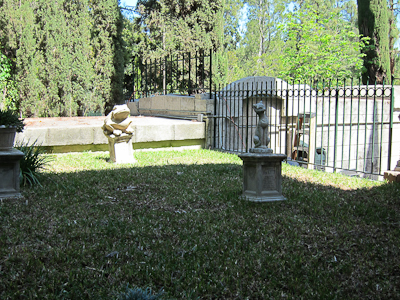 Here’s another view. 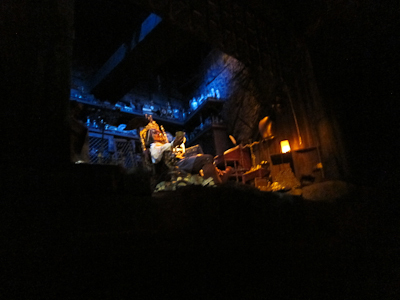 Really, I think this part is the best audio-animatronic in the entire park. And then you come back to ground level and float on by the island you saw going in. 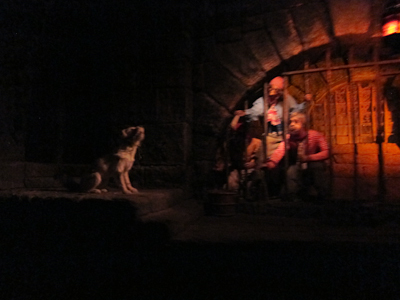 I absolutely love Pirates of the Caribbean. 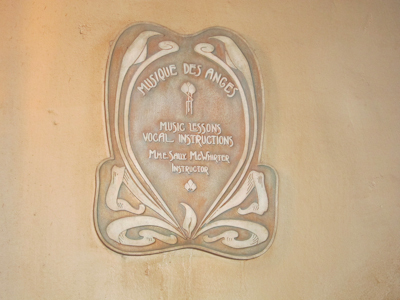 It’s definitely a must-do at Disneyland. 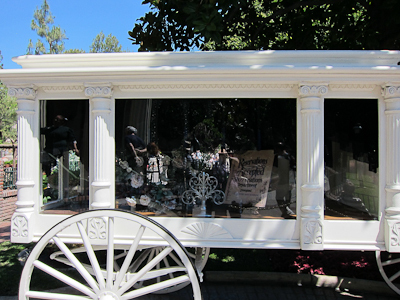 Before I started this blog, I would have told you that there’s only one fortune teller in Disneyland and it’s Esmeralda at the Penny Arcade on Main Street. But now I know better! 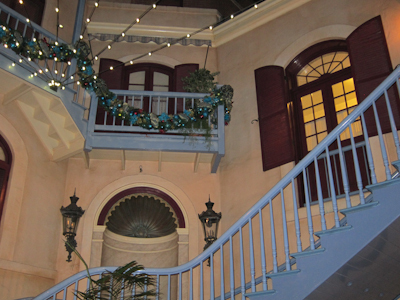 Not only is there the genie lamp in Adventureland (who told me I was going to win the Superbowl–I want my 50 cents back), there’s also Fortune Red in New Orleans Square. 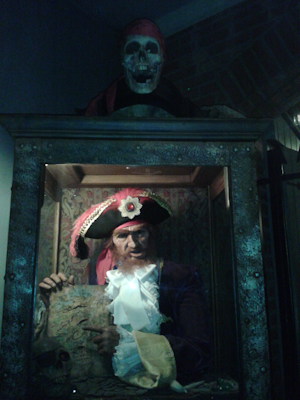 He’s an old pirate hidden away by the Pieces of Eight shop. 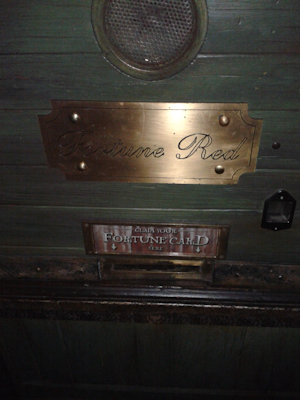 Fortune Red looks pretty much exactly like the other pirates in Pirates of the Caribbean, if the other pirates in Pirates of the Caribbean were unceremoniously chopped in half and shoved into a glass box. "Yar, it's a little claustrophobic in here"
Just like the other pirates in the Pirates of the Caribbean, he fixes you with his unearthly stare as his head kind of moves back and forth with no apparent purpose other than “thanks for putting 50 cents in!” His finger hovers over his map and makes hasty jerking motions, as if he really wanted to tell you where the treasure is but he can’t quite remember himself. And over all this, a short version of “A Pirate’s Life for Me” plays. It’s all kind of odd, really. And then your fortune pops out. 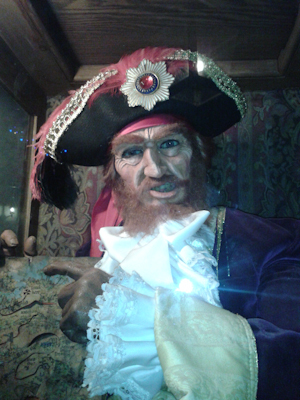 "In your future, I see you typing all of this out for your blog..."
FORTUNE RED has this to say: Ye sails yer ship with a steady helm and a weather eye out fer the luff o’ the sails. Though lackin’ in formal book learnin’, ’tis with a will ye worked to develop a keen mind. 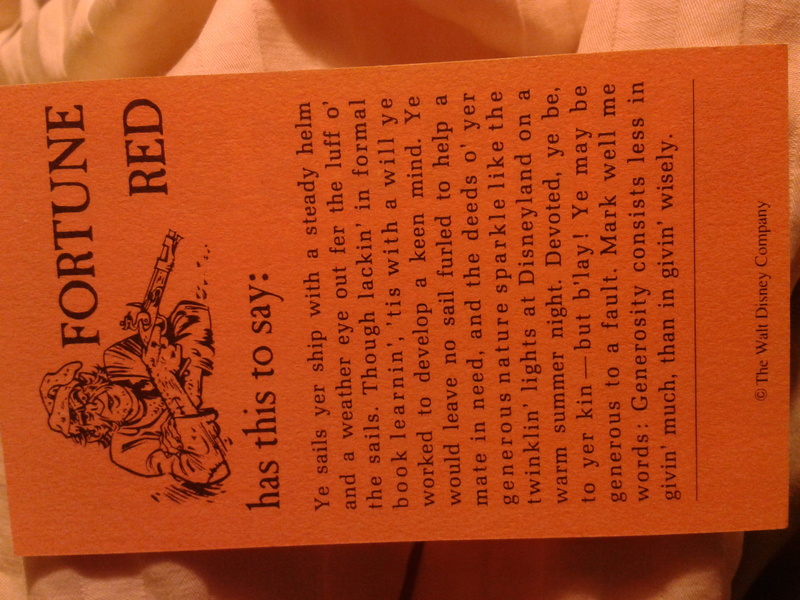 Ye would leave no sail furled to help a mate in need, and the deeds o’ yer generous nature sparkle like the twinklin’ lights at Disneyland on a warm summer night. 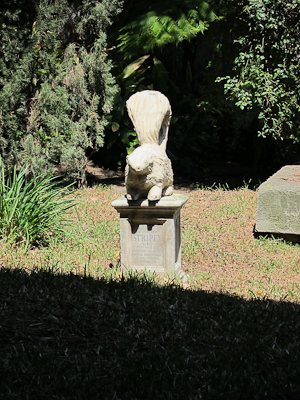 Devoted, ye be, to yer kin–but b’lay! Ye may be generous to a fault. 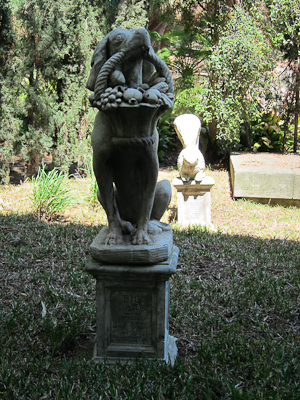 Mark well me words: Generosity consists less in givin’ much, than in givin’ wisely. I’m not 100% sure what this is, but I think I’m flattered? I sail my ship with a steady helm, okay. I’m lacking in formal book learning–hmmm, I have a bachelor’s degree, a master’s degree, and will complete another master’s in July (provided I survive to the end of the semester), so I’d say Mr. Red has some pretty high standards there. Also I’m a snob and an elitist. And also, I’m helpful to friends in need and my generosity lights up the night like a million iterations of the Main Street Electrical Parade (paraphrasing). However, perhaps I should give less and give wisely. I’m trying to think of something profound to say here, but Mr. Red has left me kind of uninspired. Yes, in case you’re not satisfied with your rather ill-suited fortune (except the part about my generosity lighting up the sky like the 9:25pm showing of Remember…Dreams Come True) (paraphrasing), you get a brief lesson in the Jolly Roger. 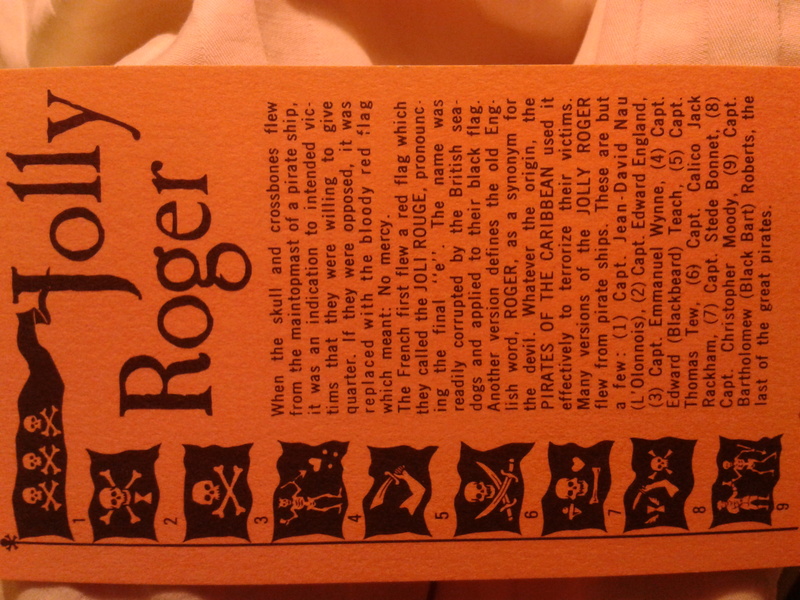 Or as the card puts it, the JOLLY ROGER. 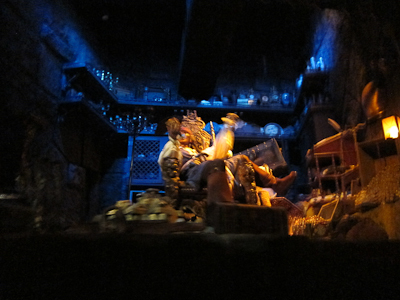 From the PIRATES OF THE CARIBBEAN. When the skull and crossbones flew from the maintopmast of a pirate ship, it was an indication to the intended victims that they were willing to give quarter. If they were opposed, it was replaced with the bloody red flag which meant: No mercy. So no red flag means you’ve still got a shot. And also, how much do I love the word “maintopmast”? Can we bring that back into standard usage, please? 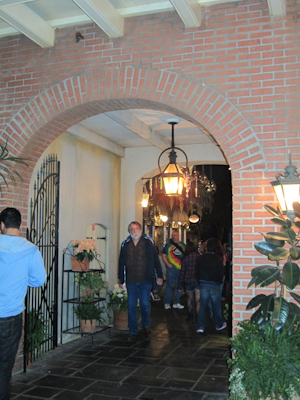 New Orleans Square is such a lovely place to walk around. Little details everywhere are just delightful. 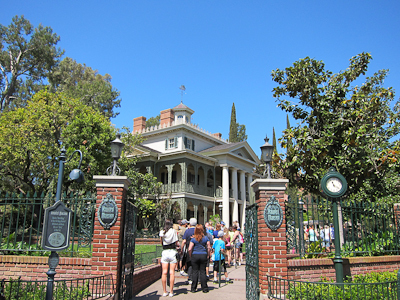 So it makes me feel incredibly guilty that I’ve spent so little time there in all my time at Disneyland. Although that’s what this blog is for, right? For example, I had no idea this existed. 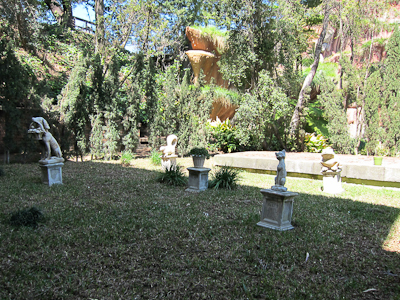 Tucked away close to the exit of Pirates of the Caribbean (and speaking of feeling guilty, because as many times as I’ve ridden Pirates, I’m pretty sure I never turned my head left coming out of it) the Court des Anges is a cute little courtyard. 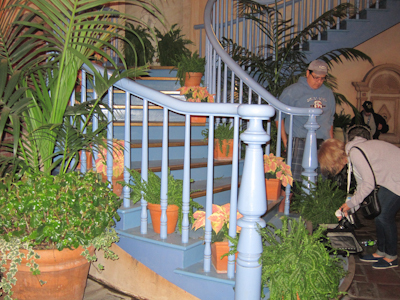 The main staircase, which is pretty much the focal point of the Court, starts out looking like this. To a Cast Members Only door up at the top. 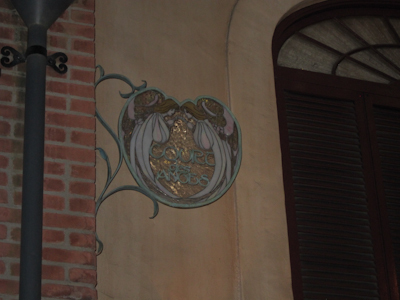 And unlike many of my other entries in which I kind of flail around pointlessly, I can say that this is actually part of Club 33. Ha! I knew something! I think. 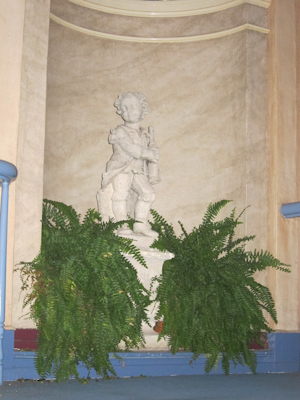 But speaking of knowing things, or not knowing them as the case may be, partway up the stairs there’s one of those thingies that’s a recessed half-circle with a little statue of something. And I’m sure there’s a name for this type of thing, but I have no idea what it is. Anyone? 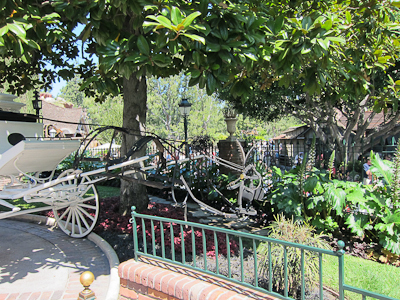 Also, much like Main Street, you can do various fictional things in this Court. I’ve often thought that it would be awesome if some of these things were real. Like if you really could go to the dentist in the shop by the lockers on Main Street. I mean, I would totally do that. Or take music lessons or something. How cool would that be?